It’s four in the morning and you’re in the mountains, gazing at a sky lit by stars. A hundred headlamps reveal fellow racers as they anxiously sync watches and GPS units, take selfies with long-lost running buddies and do last-minute stretches before being loosed on the dark trails. It’s so cold that vapor puffs punctuate every word. The horn finally blares, and you hope the countless days spent training pays off. Welcome to the sport of skyrunning, where athletes sprint up and down peaks at least two kilometers high. Unlike long-distance road races, where athletes can space out to reach an almost Zen, trancelike mindset, skyrunning constantly requires one’s full faculties. Sprinting on trails atop razorback ridges and dense rainforests: this needs continual calculation, total awareness, and split-second timing. A stray branch, a camouflaged root or a loose rock, any of these can snag your shoe and turn a downhill sprint into a tumble-in-the-jungle. As a young Loyola Mountaineer years ago, we spent three long days scaling the four peaks comprising the Kibungan circuit in Benguet. For my last skyrun a few months ago, we covered the same ground in just 10 hours, playing running and sprinting games to boot. Runs are often conducted in searing heat or pelting rain, up gentle slopes and down rocky ridges. But in between labored breaths and torturous uphill strides are moments of unexpected clarity. In the endless hours of running, one develops the steeliness and inner strength of a Spartan, making lifelong friends along the trail too. Often your legs will hate you—but your soul will thank you. “It’s pure adrenaline, like downhill biking or sprinting. Your entirety is devoted to a single task. Skyrunners yearn for speed but take time to enjoy some of the best mountainside views in the country,” shares Meyo Rodriguez, a veteran Philsky racer who has competed internationally. With most races, swatches of pain punctuated by beauty, I’ve heard finishers swear they’d never, ever go through a course again. But they do, over and over again. It seems the lure of the mountain trails is strong, and that’s where Philsky comes in. Established in 2009 to promote the sport of skyrunning as a sustainable sport and ecotourism activity, the Philippine Skyrunning Association (Philsky) develops and mentors trail athletes. It is the only governing body accredited by the International Skyrunning Federation (ISF). Its 60 members have competed in such territories as Austria, Hawaii, Hong Kong, Japan, Malaysia, Scotland, and Switzerland. Philsky recruits locally, with most applicants hailing from mountaineering organizations or running clubs. Induction runs are held once or twice yearly. Mine took me up and through the pine-covered slopes of Mt. Kalawitan near Bontoc. We started at dawn and ended way past sunset, full of limatik bites and great memories (I got lost and ended up enlisting a Bontoc scout named Rifle–really, his name was Rifle) to get back on track. Philsky also organizes the Akyathlon, the annual Philippine skyrunning national championships, held this year in Tinongdan, Benguet. Ranging from a five kilometre vertical run to a full 49 kilometre race, the Akyathlon covers some incredibly scenic areas, taking runners past highland ricefields in remote villages, pine forests and over churning rivers, before ascending mighty Mt. Ugo. Philsky empowers local communities by featuring indigenous culture and ensuring that funds trickle down to help develop the communities around the race area. Athletes need the right gear to survive and excel in skyrunning. “Your basic kit consists of a vest or small pack, good trail-running shoes, up to two liters of water, headlamp with spare batteries, GPS-enabled mobile phone, emergency whistle, first-aid kit and easy-to-burn food like trail bars or gel packets,” explains Philsky member and fitness coach Iris Torculas. Training involves road-runs on weekdays and hill runs on weekends, popular spots being La Mesa watershed, Shotgun, Timberland or nearby mountains. “The best way to train for a race is really to climb, so experienced climbers and runners have an edge in application,” adds Torculas. Running day and night, exposed to the weather, with blistered feet and tortured muscles, sometimes for over a hundred kilometers, doesn’t sound too fun. Still, more and more people are taking to the trails. Why? One theory is that people have become disconnected from their bodies. Today’s modern lifestyle is based more on operating computers and other machines, rather than actually doing physical work. People no longer enjoy the full faculties of their bodies, which is why they go to gyms, yoga studios or the outdoors, to feel their bodies and ‘find their center’ once more. Extreme sports provide a noteworthy high as the stakes are ramped up. The more extreme the sport, the higher the high, and skyrunning is near the top of that list. “We aim to expand and to continue promoting the sport of skyrunning. The bigger skyrunning here is, the more opportunities we’ll have in representing our country in international skyrunning events for both elite and normal runners,” says Philsky head Trina Concepcion. So long as people take to the trails, Philsky will be ready. Think you’ve got what it takes to run to the sky and back? Then contact the Philippine Skyrunning Association. 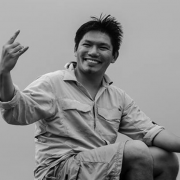 Gregg Yan is a runner, mountain climber and diver who writes about environmental and anthropological issues. He has climbed nearly 150 mountains in Asia. His knees haven't given out yet. Add him on Facebook to talk.